I wandered onto the comment section of the St. Louis Post-Dispatch, reading about the shooting in Ferguson, Missouri, where unarmed black teen Michael Brown was killed by a white police officer. Reading the comments was an eye-opening experience, to say the least. America has a long and hard road ahead to deal with its deep-seated racism. It was truly astonishing and disheartening. I know racism still exists (and I know comment section aren’t bastions of intelligent discourse), but the level of vitriol and hate was astounding. The initial altercation is unclear. But any time a teenager is shot by police – an unarmed teenager who was running from the officer – serious questions should be asked. All Americans should stop and reflect. Unarmed, fleeing teenagers should never be shot by police. Ever. There is no justification for using lethal force against an unarmed teenager. Yes, Brown weighed nearly 300 lbs. Yes, Brown had shoplifted shortly before being confronted by Wilson (as confirmed by reports, the confrontation was not due to the prior incident). Call backup, and if warranted, other officers can help tackle the kid to the ground, or whatever. Don’t shoot him at least six times, not as he’s running away or, as many suggest, surrendering. When a teenager is stopped for walking in the street, there is no reason that he should lose his life. Ever. Jaywalking leading to a dead unarmed teenager? That should never be an acceptable progression of events. Ever. As reasonable as that may sound to me, many of the commenters on the St. Louis Post-Dispatch article didn’t agree. Brown was a “reject”, one commenter declared, who couldn’t follow the simple rule of keeping his steps on the sidewalk. The incredible statement tacitly implies that Brown deserved his fate. Step off the curb, die in the street… perfectly logical, killed at the hands of one who is meant to “serve and protect,” no less. Ferguson is clearly a broken community. How long has it been broken? The fault lines must have been widening for some time to allow such an incident to take place. 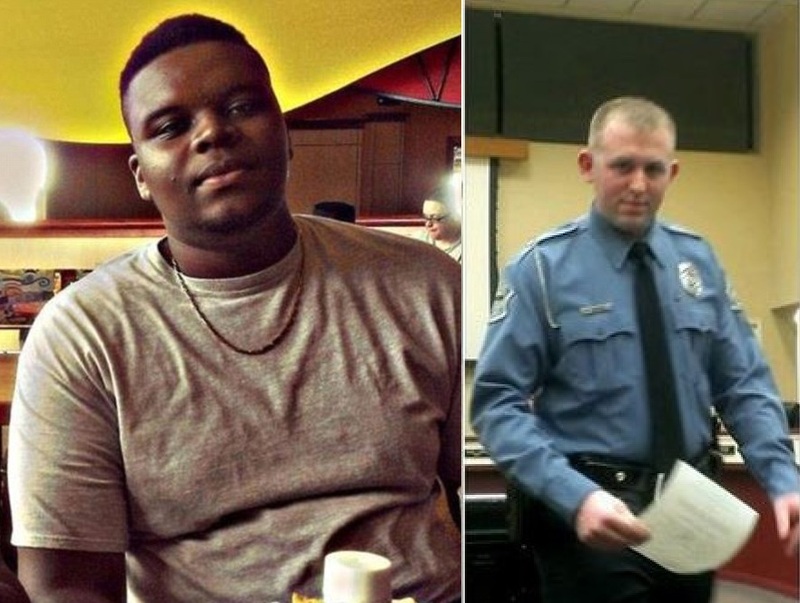 What happened between Wilson and Brown illustrates a simple fact: The officer did not consider himself to be in the service of Brown, nor was Brown a citizen deserving of his protection. He meant to show his authority by shunning Brown from the street, and an altercation ensued. If the initial altercation was somehow due to Brown’s disrespecting the officer’s unnecessary dispensing of his authority, how many years of living in a broken community does it take for such a ridiculous altercation to take place, for such attitudes to fester? Neither Brown nor Wilson viewed each other as being on the same side. Indeed, they perceived each other as, well, an other. That is an institutional, racial, social, economic divide that played itself out accordingly. The result: an unarmed teenager shot not once, not twice, but at least six times. Why? For walking in the street. When an unarmed teenager, whether black or white or Hispanic or Japanese, is gunned down by a police officer, and people make such disparaging remarks, it is truly the sign of a broken system, a broken community, and, perhaps, a broken country. Unarmed teenagers should never be killed by police. Ever. Are police not trained to deal with unarmed “threats” without resorting to lethal force? It seems very unlikely that Brown, who was already fleeing, would turn to charge an officer with a pistol drawn. Until Americans come to terms with the need to shoot people and the deep-seated institutional socio-economic racism that leads to such absurdly unnecessary events, America’s racial relations and gun culture will never improve. Apparently the “most critical moment of the confrontation,” according to the St. Louis Post-Dispatch, “is whether Brown moved toward Wilson just before the fatal shots, and if he did, how aggressively.” That better be pretty damn aggressive to gun an unarmed teenager down who had only a moment before been fleeing in fear. Americans are just all-too eager to pull the trigger on unarmed “threats,” particularly when they’re unarmed black teens (see Trayvon Martin and other incredible Stand Your Ground incidents). Home of the brave, indeed.